SPD leader Martin Schulz offers German voters more of the Third Way politics they hate in a shiny new package. Given the more volatile political battles raging in neighboring Holland and France, many aren’t paying attention to Martin Schulz, former European Union bureaucrat, now the savior of Germany’s Social Democracy Party (SPD). This local soccer hero from the Dutch-German border served as the SPD’s strongman in the European Parliament for the last twenty years. Now, after an unprecedented 100 percent vote elected him leader and frontrunner for the federal elections at the party conference last month, he has transformed into a social media-savvy messiah and darling of the mainstream press. His ascension also ended Social Democracy’s six-year polling drought — the party has overtaken the Christian Democrats Union (CDU) and broken the 2017 election wide open. Schulz’s sudden arrival as a major national figure reflects an important change in SPD electoral strategy, as it attempts to replicate the personality-cult politics found in the United States and, to a lesser extent, the United Kingdom. Clearly looking for the meme magic they’ve watched galvanize the youth vote abroad, Schulz and company have imported North American campaign strategies in what can only be described as a case of combined and uneven development in the field of communications. And yet his campaign is portraying Schulz as a breath of fresh air. His presentation as someone who “gets” young and frustrated voters seems to be working: the SPD has shot up in the polls and swelled it ranks by over ten thousand new members — a major achievement for an organization that shed over half a million in the last four decades. While the Social Democrats’ disappointing performance in the Saarland state elections last month suggests the “Schulz effect” may be superficial, it nevertheless helps us understand the state of German politics in the context of the ongoing European political crisis. Not only does Schulz lack the charm of insurgent reformers like Bernie Sanders, he’s also in no position to criticize neoliberal reforms: he’s deeply implicated in the last twenty years of German establishment politics. 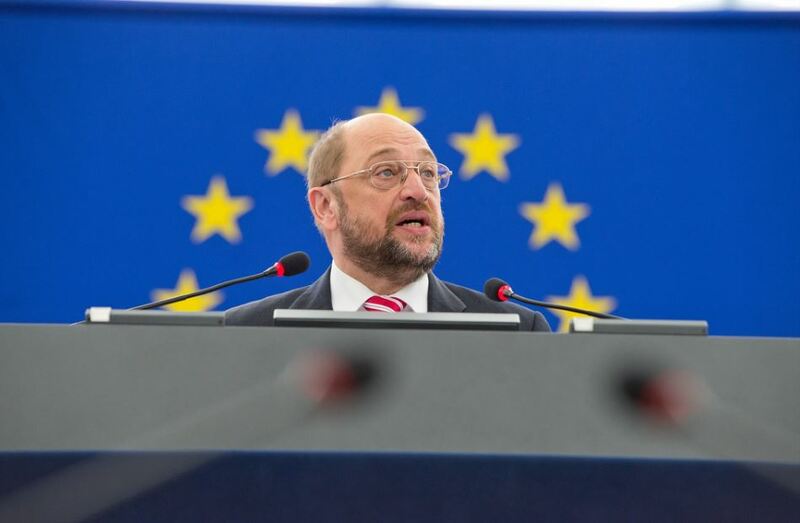 Elected to the European Parliament for the first time in 1994, Schulz quickly climbed the ranks to lead the SPD delegation from 2000 until 2004, when he became head of the Party of European Socialists’ parliamentary group. In 2012, he was elected parliamentary president. In 2003, he came to international attention in an incident that touched the highest levels of European Union politics: Schulz heckled then-Italian president Silvio Berlusconi during a speech in Strasbourg, raising potential conflicts of interest related to the Italian’s vast media empire. Visibly offended, Berlusconi retorted that Schulz would play a good Kapo (a concentration camp guard) in a Holocaust movie. The ensuing spat between the two governments ultimately prompted Berlusconi to personally apologize to then-German chancellor Gerhard Schröder. Although little more than a historical footnote, the incident has come in handy for Schulz a decade later, deployed as evidence of his tough, yet decidedly liberal pro-European stance. Schulz launched his candidacy for president of the European Commission in late 2013. Although he would ultimately cede the position to Merkel’s nominee, he made his views on the relationship between Germany and the rest of Europe clear with an advertisement in the right-leaning tabloid Bild, informing voters that only a vote for the SPD would ensure that the commission had a German president. Schulz’s rhetorical tap-dance to the left has forced him to criticize some aspects of the SPD’s past and address economic inequality in his own country, but he has yet to express any substantial regret about how German policy has exacerbated economic inequality across the European periphery, nor do his robust defenses of European integration include calls to democratize the union’s institutions. Tsipras promised the Greeks he would improve the situation in which they find themselves by negotiating changes with the European Union. He would be well advised to tell the Greeks: “I can try, but I can’t guarantee you anything.” That would be the truth. In sum, Schulz is no “left-wing Europhile” returning from the wilderness to inject his country’s staid political culture with a jolt of social-justice enthusiasm. Rather, he’s a classic SPD machine politician reinventing himself in light his party’s crumbling appeal among wide swathes of the electorate. He may truly regret what his government did to the Greek people, but his role within the establishment ultimately determines his public position. In policy terms, Schulz and the SPD adhere to the German export model, believed by many to be one of the leading causes of economic dysfunction and imbalance in the wider European Union. He has no plans to fundamentally reconfigure political priorities in Germany or the European Union. At best, he’ll soften a few of the sharper edges and give the German-led political center a friendlier face. The exhaustion of the European political center has manifested in different ways and at different speeds across the European Union, in line with the crisis’s centrifugal nature and its various effects on national economies and regimes. Some of its most dramatic expressions can be observed in the European south, where Italy’s parliamentary left self-immolated and Greece’s once-dominant social-democratic party, Pasok, fell apart. In countries whose economies collapsed virtually overnight, the traditional, centrist parties lost massive segments of their base very quickly, while insurgent voters and social movements propelled new formations, like Syriza, to the fore. Developments in the northern countries, where the crisis remains more controlled, have proceeded at a different pace: there, the political center hasn’t crashed so much as slowly and painfully declined. In Germany, this appears in the historic drop in both CDU and SPD membership, albeit more dramatically for the Social Democrats. For eight of the past twelve years, the two parties have governed together with the SPD serving as junior partner. It’s hard to discern much difference between these CDU-led governments and Germany under Schröder, who served as chancellor for seven years before Merkel took power. The grand SPD-CDU coalition illustrates Tariq Ali’s notion of the “extreme center,” characterized by interchangeable neoliberal regimes, stagnating or declining living standards, and a growing sense among the electorate that all establishment politicians are corrupt and self-interested. The German economy, however, has performed relatively well — or at least remained stable — during this period. Workers in Germany see the terrifying reality facing their Greek or Spanish colleagues and cling tighter to the shrinking center, accepting temporary wage freezes and reduced hours in return for job retention and the promise of long-term economic stability. This situation has benefited the Christian Democrats much more than their junior partners. The persistence of Germany’s extreme center, with Angela Merkel as its public face, has meant that she and her CDU can lay claim to the coalition’s positive aspects, while negative developments further discredit the political mainstream as a whole and have particularly damaging effects for the SPD. Traditionally regarded as a moderately left-wing party that represents the common people and their interests, serving as Merkel’s right hand has eroded its public profile and relegated it to historically low returns in many recent elections. In this context, Schulz appears as the latest step in the long, gut-wrenching decline of what was once the largest and most powerful socialist party in the world. Even after its historical apex before World War I, the West German SPD — personified by Willy Brandt, former resistance fighter and party leader from 1964 to 1987 — remained a powerful social force and advocate for effective reforms in German politics. Although it formally dropped Marxism and embraced its place in the political establishment, the SPD nevertheless organized over one million members well into the 1970s, when every sixtieth West German citizen was a card-carrying member. The party successfully united its loyal bases in heavy industry with left-leaning academics and white-collar professionals who were leaving the working class thanks to the university boom. Although it no longer posed a threat to capital, the SPD still promoted a compelling platform of social reform and material improvements for working people — a far cry from today’s empty, technocratic shell. Its youth wing, the Young Socialists or “Jusos,” became home to hundreds of thousands of young West Germans. Often leaning far to the left of its mother party, Jusos built connections between the party and social movements regardless of any reformist treachery occurring at the top. Moreover, the organization made space for sophisticated political debates unimaginable in German student politics today, let alone among the technocratic careerists who belong to the youth wing’s modern iteration. Well into the 1980s, SPD members regularly participated in demonstrations and activist organizations. Given the veritable funeral dirge that is SPD internal life today, many of today’s young left-wing activists would likely find this state of affairs impossible to imagine. The SPD’s blend of reformism with a weakened — but nevertheless real — mass social base became increasingly tenuous as the economic golden years drew to a close. Helmut Kohl’s 1982 chancellorship began sixteen years of CDU hegemony until Gerhard Schröder broke the conservatives’ reign in 1998. By then, the lifeworld of Willy Brandt’s SPD had receded considerably: globalization produced massive job losses in many of Germany’s industrial heartlands, and some twenty million new citizens from the former East fundamentally altered the country’s political map. In line with similar intellectual developments in other parts of the world, Schröder and figures like Franz Müntefering began transforming the SPD into a modern neoliberal party. This process accelerated considerably after Hans Eichel replaced the old-school Social Democrat Oskar Lafontaine as minister of finance in 1999. Eichel swiftly enacted cutbacks and budget consolidation policies in direct contrast to the SPD’s traditional taxation models. The SPD-Green coalition liberalized financial regulations and launched the infamous “Agenda2010,” which implemented far-reaching, neoliberal changes to the welfare system that no Christian Democrat had ever dared to attempt. Although analysts credit Agenda2010 with resuscitating the German economy in the 2000s, it also lowered living standards and heightened social alienation among the country’s most marginalized populations. The party’s ideological orientation kept up with these new policies, as attested by the 1998 position paper Schröder wrote with Tony Blair. Their bold new path allegedly emphasized “economic dynamism and the unleashing of creativity and innovation,” while admonishing readers that past social democrats had “sometimes confused [social justice] with the imposition of equality of outcome.” The Third Way governments enacted the policy implications drawn from these observations: welfare reform, financialization, and neoliberalization more generally. Some of them would later support the illegal American war in Iraq, and none them retain much political credibility today. As Schröder and his comrades “modernized” the SPD and brought it in line with German capital’s interests — and thus into conflict with its traditional social bases — membership began to unravel. Between 1990 and 2002, 3 percent of members left the party every year, and over 5 percent resigned annually in the years after Agenda2010. This process culminated in the founding of Die Linke in 2007 after several currents and prominent individuals, including the aforementioned Oskar Lafontaine, abandoned the party. Not soon after, the SPD would lose its status as the country’s largest political party to the CDU for the first time in history. The SPD leadership fundamentally changed in this period. Buoyed first by the wave of educated workers joining the party in the seventies and eighties, membership became fairly equally distributed throughout society, with growing white-collar and middle-class concentrations and a declining working-class base. Nevertheless, the party leaders still came from the ranks of Brandt’s SPD — Schröder had led the Jusos in the 1970s — and were socialized in the party’s traditions. Although often perceived as brash and arrogant, many members of Schröder’s team nevertheless possessed a degree of political charisma gained through decades of party work. As the SPD shifted to the center, it began to attract a different kind of member. The generation of politicians now running the party are not the local peace activists, union militants, or leftist students that once characterized it, but political opportunists who began their careers precisely when large chunks of the SPD’s left wing were abandoning the party for Die Linke. These new leaders were not trained in Brandt’s SPD or in the social movements but learned politics in student parliaments and party factions. Their strategy amounts to electoral logics and tactical alliances; unfortunately, Schulz shares this orientation. What remains of the SPD’s left wing is now marginalized, restricted to public figureheads like Hesse’s Andrea Ypsilanti, who cofounded the left-reformist think tank Institut Solidarische Moderne in 2010 with politicians from Die Linke and the Greens. Although several loosely organized left-wing currents still exist, their strategic perspective doesn’t go beyond imagining an SPD-Linke-Green coalition in the federal government, and they have little influence over the power politics that dominate today’s Social Democratic Party. As the SPD’s position among voters has declined, so has its ability to intervene beyond the parliamentary stage. Remnants of the old party of course persist, but without any young recruits calling for a different political approach, real organizational renewal in the future seems unlikely. The Schulz effect has found its footing in this party and this political context. The Third Way’s brash confidence faded when its promises were revealed as empty, and today’s SPD limps from defeat to defeat under a rotating cast of half-hearted leaders. Because the party’s transformation into a shadow of its former self with a declining base cannot be reversed, the team around Schulz is trying to pivot their messaging and orientation. Die Linke’s tepid but more or less permanent presence on the political landscape necessarily prevents the Social Democrats from moving too explicitly to the left, so now it wants to gain ground among students and young professionals as well as any voter uneasy about the rise of the right-populist Alternative for Germany (AfD) looking for a dependable centrist alternative to Merkel. The party’s current state and the damage done by its neoliberal turn limit it to superficial, purely tactical options. As German cities boom with the latest iterations of the “new economy,” Schulz is trying to reposition the SPD as a hip party that believes in some cloudy notion of social justice and progress. This means rebuking the dog-whistle politics of the AfD and some parts of the CDU while supporting multiculturalism and, to a limited extent, the rights of refugees. Indeed, Schulz’s rise has contributed to a surge of public interest in topics like social justice and income inequality, to the detriment of anti-Muslim fearmongering and refugee hysteria. For this, at least, we should be thankful. We can interpret his vague yet militant pro-EU stance from a similar perspective. Schulz has held a tough line against Brexit and praised European integration to the skies, but he remains almost silent on Greece and EU policy specific more generally. This corresponds to the views held by wide swathes of moderate German voters, who combine a real sense of commitment to the European community with ignorance at best and national chauvinism at worst when it comes to the European south’s economic realities. Germany’s undisputed role as EU hegemon adds a potentially sinister undertone to this rhetoric, as championing the European status quo means championing German dominance. The German media calls 2017 a “super election year,” in which a series of regional votes help predict the outcome of this fall’s parliamentary election. The SPD lost a percentage point in the aforementioned vote in Saarland while the CDU gained five points and will continue to rule the state in a grand coalition. To what extent this vote reflects any nationwide trends remains to be seen, as Saarland is quite small and has a unique political makeup — Oskar Lafontaine hails from there, but Die Linke, which campaigned largely on the promise of an SPD-Linke coalition, did relatively poorly. The results suggest that German political trends remain largely unchanged, as the Free Democratic Party (FDP) and Greens missed the 5 percent hurdle and the AfD slid in with slightly over 6 percent, making Saarland the eleventh state parliament in which the right-populist party has gained seats. It would thus appear that the “Schulz effect” remains largely superficial for now. That a section of the electorate seems genuinely excited by him says more about the drab state of German politics than it does about Martin Schulz or the party as a whole. Young voters in particular are understandably alienated, coming of age as neoliberalization and the consolidation of the extreme center were already well underway and thus having little memory of a livelier political culture with a greater range of options. Die Linke, unfortunately, has been chasing the specter of a left-wing coalition government on the national level for months, despite the SPD hoping to marginalize them with Schulz’s newfound popularity. The limited extent of the crisis in Germany has prevented the drastic shifts in the political landscape that we have seen in Greece or Spain, but the country’s politics faces the same long-term affliction. As the parties of the extreme center chain themselves ever tighter to the sinking ship of neoliberalism and austerity, the range of policy shifts they can make shrinks, narrowing the political landscape to shallow media stunts. Schulz represents such a stunt. However competent an establishment politician he may be — one could certainly do much worse, as the recent American election shows — Martin Schulz will not make the Social Democrats a powerful force for social change. We won’t learn about his proposals until he releases his official campaign platform this summer, but we can safely assume that it will be more of the same, albeit with a modernized social media presence and more prefabricated enthusiasm.